This 8-litre Hispano-Suiza H6C of 1929 (chassis nr. 12217), with coachwork by Saoutchik, was ordered new by a Dutch gentleman by the name of Mr. Thurkow. He lived in The Hague, on Plein 1813 number 1, and here is the amazing story of his car as The Netherlands was invaded by the Nazi forces in 1940. Apparently Mr. Thurkow’s chauffeur, an ardent German nationalist, had favored him buying a Maybach, but Mr. Thurkow was bent upon proving that Germany had no monopoly on motoring excellence. Then Hitler came to power and the chauffeur became an avid Nazi sympathizer. After the invasion of The Netherlands in May 1940, the German occupying forces requisitioned all large and fast automobiles and the, by now former, chauffeur wanted to take revenge on his master by turning Mr. Thurkow’s treasured Hispano over to the German authorities. However this plot was foiled and Mr. Thurkow had a mechanic friend smuggle the Hispano out of The Hague and hide it. The car wound up under a haystack at a farm in the countryside. From then on the former chauffeur, furious at being cheated, used any and all means to strip Mr. Thurkow of his possessions. The old man refused to reveal the whereabouts of the Hispano and when he died near the end of the war, he carried the knowledge of the Hispano’s hiding place to his grave. The Nazis, keen to capture as many badly needed vehicles, became aware of the Dutch secret of hiding cars, as well as people, in haystacks. They raided farms and drove long sticks into the haystacks to see if there was anything inside. Thus the Hispano was moved from farm to farm, until this became too dangerous. Then the decision was taken to simply remove all wheels and hide those, with the expectation that it would be extremely difficult for the Nazis to find a set of RAF-hub wheels of the correct size. And indeed the Nazis did find the car, but it was of no use to them without the wheels and they left it where it was. 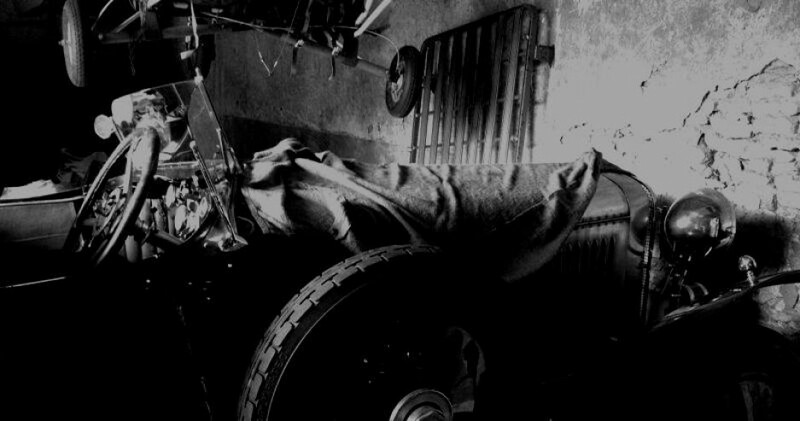 0When hostilities were over the estate of Mr. Thurkow had to be settled and the trusty mechanic tried to carry out the wished of his deceased friend and this is how the car ended up with Jhr. van Lennep, a Jonkheer who lived in The Hague. As a student he had to sell all he had to be able to buy the Hispano. His family was mortified whilst he was ecstatic and his friends thought him psychotic. However, he was soon to face the common problem of a leaking cylinder block, caused by electrolysis after all those years of strorage in a humid barn. So, he wrote to Hispano-Suiza in Bois-Colombes near Paris to ask for a new cylinder block. Imagine his surprise when two and a half months later a large crate arrived with a complete brand new engine! A few weeks later he received a letter from Paris telling him that this was the very last of these engines to be had, discovered in a corner of the factory. He was never asked to pay for it! Despite more modern fenders, Van Lennep continued to be the subject of ridicule and he reluctantly sold the Hispano in 1955. The buyer, Mr. de Koff, immediately took the Hispano to America in an attempt to make good money. He planned to pick up the car at the New York docks and then tour the country before selling it. However he was delayed in his plans and he found the car, already shipped some time before, standing at the docks, all tires flat, battery dead and looking pretty forlorn. Worst of all, the dock master, demanded $ 300 in back charges before he would release it. De Koff refused to pay, telling the dock master to shove the car into the Hudson River and jumping into a taxi, drove off. The dock master, pursuing de Koff in his own car, finally caught up and an agreement was reached. The dock master settled for $ 150 instead of junking the car and de Koff took the car to Long Island where he tried to sell it. It was acquired by that early days collector Joe Weider, but he seldom used it. The Hispano has been the property of a US collector for many years and is now finally getting its well deserved restoration.